The New Noses is a series on independent perfumers who came upon the craft the unconventional way: who aren't French men, heirs to perfume empires, or trained in prestigious fragrance schools. 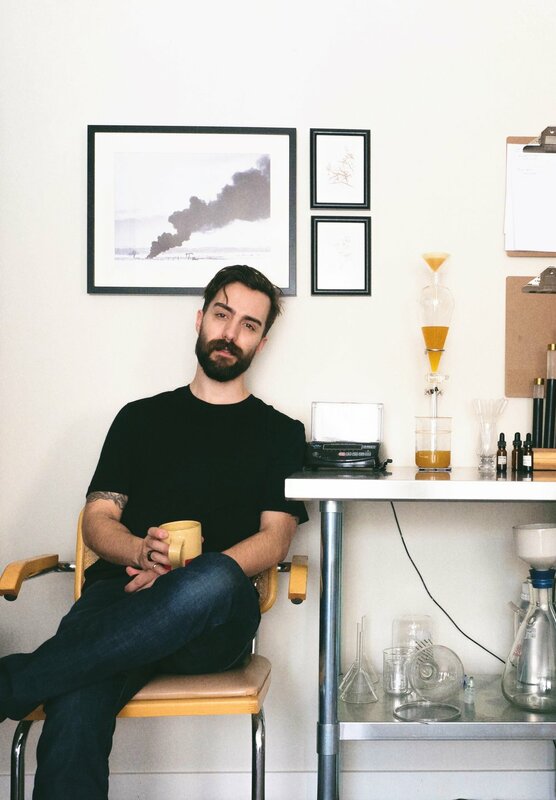 This is the second in the series—an interview with Josh Smith, of Libertine Fragrance. You can find the previous instalment here. "Libertine has been in existence for three years now. I was playing around for a couple of years before that, loosely reading and messing around with essential oils. My learning was done pretty much entirely online. There’s not a ton of information—it’s still a pretty guarded world—but there are some good blogs and forums. That’s part of the fun, too: a lot of researching and scouring the internet, trying to find sources for different accords. At the time, I was in design school at the University of Alberta. It was essentially a branding project, a side project that I wanted to undertake. It was also a form of active procrastination—instead of doing actual projects, I ended up nerding out on reading about scent composition. After a couple of years of playing around, I married the two, and did it for a pop up shop. Making a perfume has been getting harder rather than easier. It’s a the more you know, the more you know you don’t know kind of situation. At the start, everything is really exciting because everything is brand new, so it’s just really fun to play around with. Now, I have more goals that I am trying to achieve when I work. North America is the total Wild West for fragrance composition, in terms of what you can have in it, but I try to be as precise as possible. My last release took a really long time—eight months of formulation. I was working with some materials that were really difficult to finesse, called pyrazines. There are a few different ones, but all of them have a weird food-y smell—some smell green pepperish, some smell like nutty, or like burnt popcorn. They’re really strong and require very, very careful balancing. I really wanted a pistachio scent, so I was trying to incorporate these things, but I couldn’t make it work. I ended up abandoning that note. I’m still super happy with how it turned out, but it took some time to work through that problem. It’s a gourmand, but figgy: a little more candied than the typical fresh, fruity fig note. In Edmonton, my exposure to perfume was pretty much just celebrity and designer brands. It’s a lot of the same ingredients; they're definitely concerned with people purchasing it, so it has to stick to a formula that works. Thankfully, with Libertine I’m not beholden to anyone, and as much as I love that people are enjoying it, it’s totally a selfish act. With that, there’s a lot of freedom to explore materials that wouldn’t make sense financially for a big perfume house. I’m glad to be able to do that, and not have to rely on the run-of-the-mill aroma molecules. I love naturals. Natural scent is a reflection of a time and place - someone literally went out and picked hundreds and hundreds of flowers from this field and compressed them down to get this tiny, precious juice. The thing is, they are excluded from a lot of department store fragrances. One reason is there's a lot of variability from year to year. You know how you get good vintages in wine? It's like that with naturals. If it’s really hot one year, or something causes the plant to express itself differently... that won't work. Especially with the clientele, it needs to be more consistent. And aroma molecules are very consistent. Since scent is totally invisible, you have to create an alternate mental framework that you can go back to as a perfumer. I used to do a lot of imagining landscapes. It would be very place-oriented, like a field in the country, or a season. Usually I’m imagining it as a place to start gathering an ingredient list from. In that way, design and perfume are quite different. Design obviously informed the construction of the brand, and there are elements of trying to understand what the customer wants, but in terms of the actual conceptualization of a fragrance and working through the problem of trying to making a bunch of blends, I would align it more with the fine arts. Some sort of painting or sculpting; a weird invisible painting that changes over time. People think perfume is a lot more static than it is. But how it carries along on your body and changes through the day—that's actually this totally subjective, eight to twelve hour story. It's one of the unique and neat aspects to it that's not replicated in anything else that we interact with every day. I’m thinking more about stories now, and playing around with narrative. Recently I watched this documentary about the De Medici family in Italy—at a certain point, a pious pope came in and reformed the city of Florence, which was a city of hedonism and debauchery. They had a bonfire of the vanities - this pope got the entire city to burn all of their paintings and all these non-pious things. I just like this idea of people throwing all their earthily and bodily stuff into a bonfire. I’m trying to think of ways of capturing that, lipstick scents and other really beautiful hedonistic smells, then adding a tinge of smoke to it. One of my big railings against the mainstream perfume world is about the marketing. It’s so based on demographics: this perfume is for this exact type of person and it will make them feel like this. I’m trying to stand apart from that, and keep Libertine open. 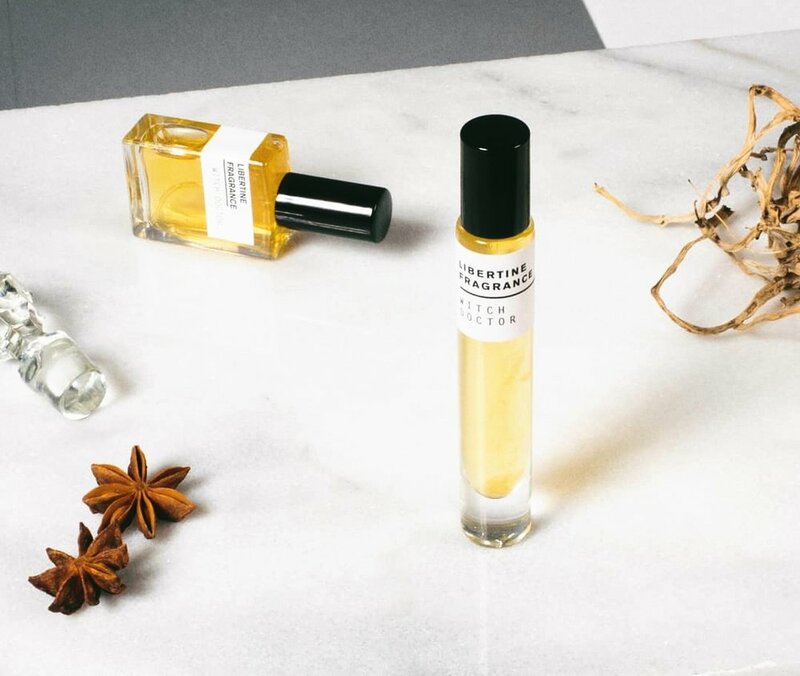 I wanted to create unisex fragrances for people to stumble upon—I want them falling in love with the scent and being absorbed in that, catching whiffs throughout the day and finding something really pleasant in it. I’m totally about the scent, so I try to keep things minimal in that way. I advertise ... poorly? It’s all Instagram. Almost entirely. Libertine feels pretty personal to me, like a personal creation that I’ve made, and I don’t like making big announcements in my own life. But I know that it’s a product that I need to be hyping up. I need a hype man. Right now, I'm just trying to describe it as best as I can on Instagram, and really convey the story through photos. Describing smells is a two-pronged process. I have the mental image that I’m working on, and then I gather ingredients to represent that. I’ll describe the story as best as I can, list the top main notes, and thread in how those notes fit into the story. Describing one usually describes the other. I've been making these three-line poems for the story, and I’ve really enjoyed doing that. They crystallize to me what the mental image is. I wish it was easier to take steps back. I know what is actually in there in terms of ingredients, because I saw myself put them in there, which makes it hard to notice if there are other associations that might come out of two ingredients mixed together. It’d be cool to take my head out of it for a second, and smell something for the first time. There could be a whole class of words that are more specific to scents that describe the feelings you get in your face from them. Words for the texture of smell. Sometimes stuff smells crunchy, or scratchy—I end up describing a lot of smells with physical attributes like that. People are like, 'You must have a really great nose!' But I think it’s all vocabulary. You definitely need to train your nose if you’re dealing with scents, but I think people could be much better at understanding scents. It’s just learning that vocabulary and being willing to make weird associations with tastes or feelings, to describe things there are no words for." Photos courtesy of Joshua Smith.